Goal: Where it is safe, get kids walking. Where it is not safe, make changes. Safe Routes to School (SRTS) programs are federal-funded, sustained efforts by community members and governments to enable and encourage children to safely walk, roll, or bicycle to school. Federal funds allocated to this program are reimbursable and available for infrastructure and non-infrastructure projects that benefit elementary and middle school children in grades K-8. The 2019 application cycle will be announced. On July 6, 2012 MAP-21 (Moving Ahead for Progress in the 21st Century Act) was signed into law. This Act established the Transportation Alternatives Program (TAP). The U.S. Congress passed a new transportation law called the FAST Act in December 2015, which provides five years of additional funding to the Transportation Alternatives Program (TAP). The updated policy supports walking, bicycling, and rolling projects and programs such as Safe Routes to School. 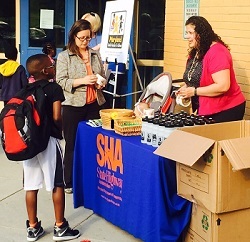 The Safe Routes to School (SRTS) Program is a federal-funded, reimbursement program administered by the Maryland Department of Transportation State Highway Administration (MDOT SHA). Eligible sponsors may apply for funding to support infrastructure and non-infrastructure activities that encourage children to safely walk, bicycle or roll to school. Federal funds allocated to this program must benefit elementary and middle school children in grades K-8 and must have a 20% cash match contribution. Work with your school, community, county and other public or private partners to develop a project today! Education: educating students, parents and neighbors of safe practices. This includes being aware of each other (neighbor/student, parent/student and neighbor/parent) and adding simple techniques to ensure the safety of those involved. Encouragement: encouraging the students, neighbors and parents to embrace the idea of SRTS. 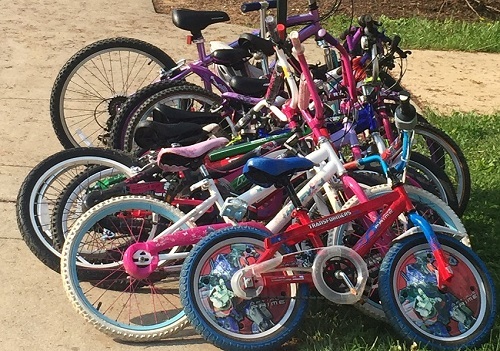 Provide incentives for students walking, rolling, or biking to school. Host events such as a walking school bus, walking Wednesdays, walking/wheeling Wednesdays bicycle rodeos and bicycle trains. Other encouragement opportunities include events hosted by after school clubs and organizations. Enforcement: monitoring the areas immediately around the school(s) by issuing tickets and warnings to those who act against the law. In addition, students, parents, community members and crossing guards learn to enforce safety. Law enforcement will monitor volunteers and the wider scope of the schools’ premises. Engineering: making changes to floating and semi-permanent elements like signage, outdoor furniture, crossing areas, sidewalks, curbs and ramps. These changes slow down traffic, add a safe place for pedestrians and bikers to travel and provide more accessibility for students to get to school. Evaluation: Observing the area to note the existing conditions. Are the sidewalks in good shape? Are the crosswalks visible? Is there a bike lane? Paying attention to where drop-off/pick-up happens. Is it organized? Is it safe? What is the distance between the drop-off spot and the school's entrance? Watching where students travel. Are they biking, rolling, or walking? Is there a path for them to walk, roll, or bike? Monitoring traffic patterns. How much traffic is there? How fast are the drivers going? Are they driving safely? Are they stopping at Stop signs? Note these observations, whether they are positive or negative. What needs improvement? What is working well? As traffic volume increases, some parents feel less comfortable letting their children walk, bicycle or roll to school safely. According to the Center for Disease Control (CDC), 85 percent of children's trips to school are made by car or school bus; only 13 percent of school trips are made by walking, rolling, or bicycling. The increase in car trips to schools increases traffic congestion and creates gridlock near school drop-off and pick-up lines. This often fuels aggressive driving by drivers stuck in these traffic jams. Walking, rolling, and bicycling to school helps children feel more connected to their community and increases their confidence that school is a safe place for learning. Teachers report that students who walk, roll, and bike to school arrive more alert and ready to work. On average, 100 people die each year in pedestrian-related incidents. As traffic volumes have increased, some parents have felt less comfortable letting their children walk, bicycle or roll to school safely. The increase in car trips to schools has added to growing traffic congestion and created gridlock near school drop-off and pick-up lines. This often fuels aggressive driving by drivers stuck in these traffic jams. Facilitates projects and activities that will improve safety and reduce traffic, fuel consumption and air pollution in the vicinity of elementary and middle schools. Funds can be used for engineering improvements, such as upgrades to crosswalks, traffic signals and signage around schools, as well as for educational and enforcement efforts. For more information see Getting Started. Approximately $19 million in grants have been awarded across Maryland since the inception of the program. The Moving Ahead for Progress in the 21st Century Act (MAP-21) program provides up to 80% of funding in federal dollars towards the project's total eligible cost, while project sponsors must provide a minimum of a 20% non-federal transportation cash match. There is currently no minimum or maximum dollar amount for a request. Potential sponsors should consider the administrative time needed to accommodate the federal requirements for procuring services, design approvals and construction when applying. Every project is required to have a sponsor or co-sponsor that is a government entity. Any other local governmental entity with oversight of transportation or recreational trails (other than a metropolitan planning organization or a State agency) that the State determines to be eligible, consistent with the goals of this subsection. Gain support from various stakeholders to include: the school principal, physical education teacher, parent teacher association, parents, local elected officials and local Department of Public Works. Support for the project is essential to success. Your supporters can also identify additional funding options for the 20% cash match requirement. Determine what prevents students from walking, rolling, or biking to school. If the problem has multiple tiers then determine what to do first and how much funding is available before additional resources are identified. Develop a plan, a cost estimate and a timeline to implement the improvements that you identified. Fill out the application, and submit associated documents. The Current Participant links below provide you with the forms, guides and tools you need to implement a Safe Routes to School Project. You must complete each form included in this section are required for current participants to fill out. Please choose the needed form from the below list. Complete the SAFE ROUTES TO SCHOOL (SRTS) PROGRAM Application . Your school must submit the School Participation Letter (100 KB). It states that the school supports the perspective project. Use the following guides and resources while the project is underway. The media can spread knowledge about a specific project and the program as a whole. Use this media and visibility guide: http://guide.saferoutesinfo.org/pdf/SRTS-Guide_Media.pdf.